Last weekend, I participated in my 12th Tout Wars auction. My first year was in 2007 when Bob Kohm and Byron Cox, who ran RotoJunkie, both had late conflicts that kept them from filling their seat in the NL league that year. I was writing for the site and had (surprise) a ton of frequent flyer miles, so I went up as a sub drafter that year. I was in way over my head and spent a lot of money early with an unintentional nerve-driven stars and scrubs strategy and finished ninth. The next season, I finished a distant second place to Mike Lombardo, and that finish remains my highest finish in 11 tries. This year's draft took place at the Richmond County Ballpark, home of the Staten Island Yankees. Adam and crew were fantastic hosts, and I sincerely hope we draft there every year. I loved being able to go into the hitting cages and shatter Steve Cozzolino's bat with my cutter, and the meal at Pier 78 restaurant after the draft was some of the best food I have eaten this year. Last season, I was in first place heading into the break before Mike Podhorzer's team got fully healthy and ran away with things. A late-season collapse for me, along with cutting Blake Snell before his first win, led to me finishing in third place when I should have netted yet another distant second-place finish last year. 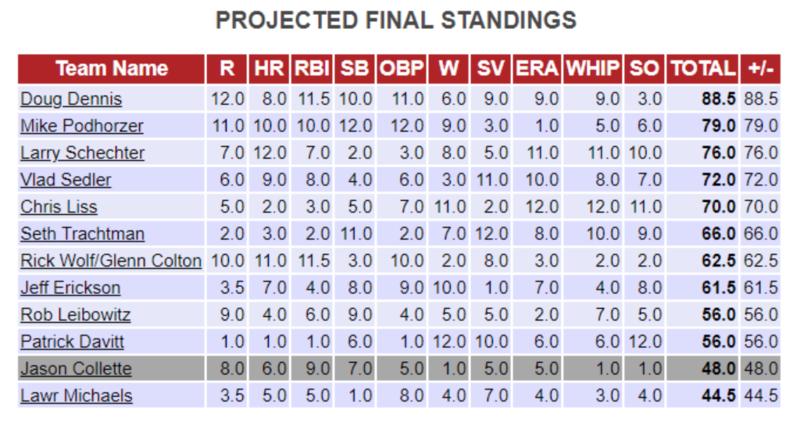 I like my chances of being very competitive this year, but both the Davenport Projections and the BaseballHQ projections do not like my team at all. I am personally offended because I am, after all, the defending 2017 AL Doubt Wars champion. If there is anyone who is good at going against the trends to get great results, it is me. 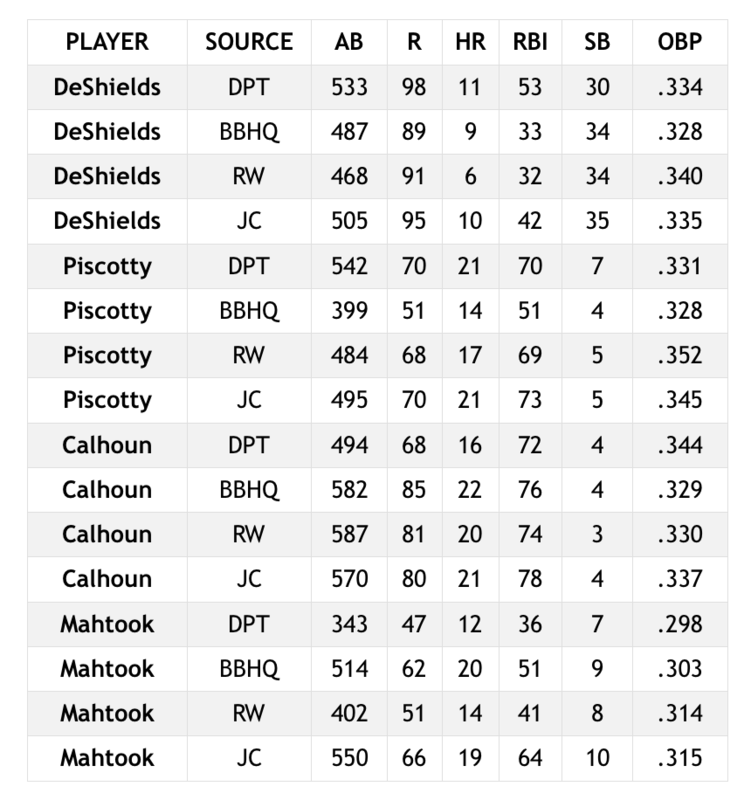 Below is the team that I put together, with projections from Davenport, BaseballHQ, Rotowire's, and the numbers I expect from the players. The numbers for Lucroy are all within the ballpark, though Davenport and HQ are not as optimistic about the RBI opportunities or his on-base abilities. Lucroy posted OBP's of .355 and .345 over the past two seasons and, inexplicably, had his worst stretch of baseball while playing for the Rockies. 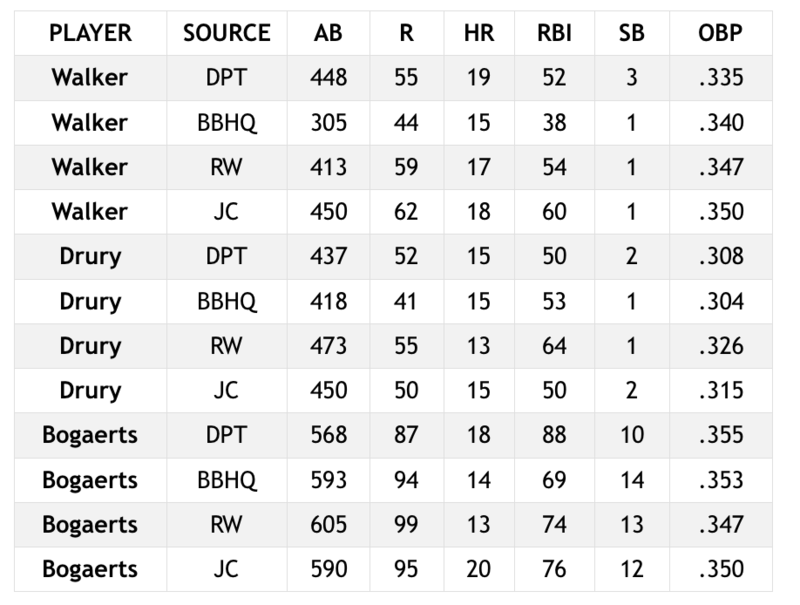 I feel the consensus is rather accurate for his homers because the 24 homers from 2016 look like an outlier for his career, but I feel the projected RBI's are a bit light given he will be playing most games of the week in what is quietly a talented lineup in Oakland. The Sisco projections are all over the place, which is not atypical for rookies. I believe he ends the year with the most plate appearances of the trio of he, Caleb Joseph, and Andrew Susac, but the list of rookie catchers that have flamed out is too long to mention. The 23-year old catcher owns a career .390 on-base percentage over his five-year minor league career which spans over 1871 plate appearances. He has not hit for any power, but that is not surprising for a young kid that has been pushed through the system rather aggressively. The second catcher situation in AL leagues is as ugly as ever, so taking a $3 chance on a catcher with demonstrated OBP abilities seemed like a wise play when he was nominated early in the third stanza of the auction for a buck. I am most aggressive on C.J (which stands for Crush Job) Cron overall, but not by category. There is a 32 point variance in his on-base percentage, and the RBI chances have a 14 point variance. Cron is an odd righty slugger who is better against righties, and he is also one of the 30 hitters I wrote about in my bold predictions this year, so I put my imaginary money where my mouth was with Cron. The Rays are going to slash and dash their way to runs this year after back-to-back years of high strikeouts and solo home runs. 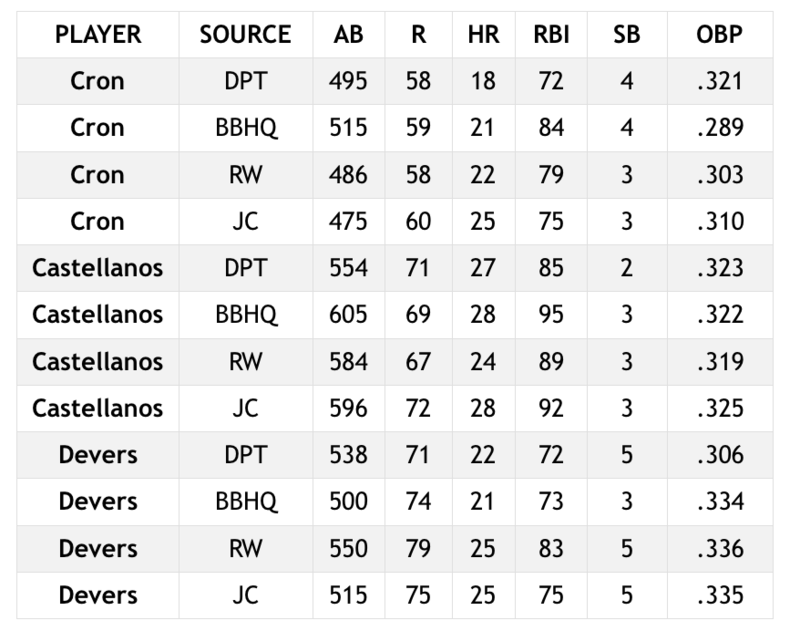 Someone is going to have to drive those guys in, and I think Cron could be to the lineup what Carlos Pena was to a similarly-constructed 2007 Devil Rays roster. Castellanos was not someone I targeted by skills but ended up on my team due to his price. He is going to play every day, and he qualifies at both third base and the outfield. That multi-positional eligibility is very handy in the single league format, and Castellanos is currently slated to hit cleanup for the rebuilding Tigers in between the fossil bookends of Miguel Cabrera and Victor Martinez. The lineup protection is there if those guys can stay healthy, but this could also be a very bad team. I am not as concerned about him getting his home runs as I am his RBIs and runs. Devers was not in the plan or the budget, but I moved dollars around from the outfield once I did not like the prices some of the targets were going for. Devers was 11 percent above the league average offensively last season as a 20-year-old and will now have the everyday third base job at the young age of 21. I believe he has a tremendous real baseball future, but this was my least favorite buy of the auction. There is no profit in his price, and there is a lot of risk in a sophomore slump if his defensive struggles in the spring carry over to the regular season. His swing is a thing of beauty, and you have better odds of sneaking a steak by a dog than a fastball by Devers, but this is normally the type of player I let someone else roster. The fact two of these three players ended up on my roster should not be a surprise to anyone as I had both Drury and Bogaerts spelled out in my AL East Bold Predictions. 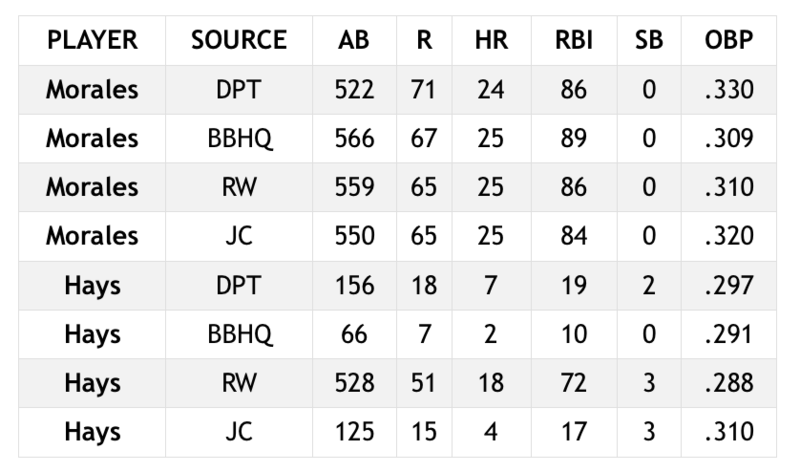 Both predictions were bold, but the one calling for Drury to hit 25 homers stands out against the projections that have him with 13-15 homers over the course of the season. Quite honestly, I'm looking at that 15 as a safe floor. Bogaerts was making nice progress last year offensively before getting hit on the hand and then trying to play through the season. I'm once again more bullish on him than the projection averages and suggested he could put up the type of production that Alex Bregman had in 2017. The numbers Bregman put up last year have him firmly in the early third round of ADP while Bogaerts has been three to four rounds behind him. Walker was not a target but was someone who I liked at the price, and for the fact he gives me another player with positional flexibility. The recent news about Greg Bird's foot could mean he starts the season on the disabled list, and while that does not impact Walker getting onto the field, it should move both he and Drury up in the lineup. Walker to the Yankees still feels like a Chase Headley situation where the expectations for his offensive output never quite match the reality while playing in Yankee Stadium, but he has a rather high floor which is played out in the projections. The outfield buys is the part of the auction in which I struggled. I had roughly $25 budgeted to get one of Nelson Cruz, Khris Davis, or Justin Upton. 30 names into the auction, I had already rostered Kendrys Morales (another bold prediction member) at $13 and Nicholas Castellanos at $19. Cruz came up as the 33rd name of the auction, and I let him go at $26 to Rob Leibowitz. Khris Davis came up six names later, and I pushed Lawr Michaels up to $27 for Davis, but again got out. Upton came up nine picks later and I pushed Doug Dennis up to $28 for him before refusing to overspend to get the last guy in the bucket of names I was targeting. I needed to get one of these three factories of production for homers and RBIs and rostered none of them. Smooth move, Ex-Lax. I purchased DeShields with the next pick after Upton and then grabbed Devers five picks later as a guy in my next tier of power production. DeShields Jr is a guy that absolutely toasted me two years ago when I made him my fallback plan for not overspending (at the time) for Jose Altuve. This year, I went back to the well and made him my primary source of speed and not completely writing the guy off because of his past transgressions to my roster. The projections are all mostly aligned on him, and I'll need every one of those 35 steals to remain competitive in the category. The other outfielders were all targets from my roster buckets of players I wanted to pursue at those roster spots. Each of them was also players I tipped my hand for in the bold prediction pieces last month. Calhoun was someone I boldly predicted would set career highs in home runs, RBIs, and batting average this season thanks to the new dimensions in Angels Stadium as well as the team's willingness to allow Chris Young to face the tougher lefties and hide Calhoun from that batting average damage. Piscotty is someone I have some shares of this year as I believe in a bounceback year. The 30-homer prediction is a reach, but a return to the 20 range is quite attainable for him while he hits in between the Matt's in Oakland. Mahtook is someone that I feel is mixed-league material in a 15 teamer, so I definitely like him in a single league format. We have a swing role in Tout which allows us to either field a second utility player or utilizes a tenth pitcher. The spot is utilized for an extra hitter 99 percent of the time, which is what I did here. I covered Morales in my AL East Bold Predictions piece as someone to target because he underperformed his metrics last season. The homers were there, but that gets overlooked in a year where everyone hit home runs. He has had a career full of either very good or very bad years with runners in scoring position, and 2017 was a repeat of his 2014 disaster in that department. This year, he is slotted for cleanup again with a good trio of hitters in front of him. I had him valued at $15, so I did not mind getting him at $13. Hays is someone I am hoping follows an accelerated path similar to Trey Mancini in 2015. Hays was sent down to Double-A Bowie a few days ago as his spring has been sidetracked by a barking shoulder. He was a monster in the Baltimore system last year as he began the year in High-A Frederick and ended it playing major league ball in September. He hit 33 home runs on the season while scoring 86 runs and driving in 103. If the Orioles leave him down until May 10th, they'll get an extra year of service time from him. In the meantime, the only things standing in his way are Colby Rasumus and Rule Five pick anthonly Santander. The play here will be patience and not cutting bait on Hays too early because he is not playing like I did a few seasons back with my final reserve pick. His name was Francisco Lindor. I was rather happy with how my pitching staff came together, even though some of my later targets went above my prices or the money I had available at the time. Richards and McCullers were my primary targets for the staff, and I budgeted $32 to get the pair. The other names I had down as backup plans for my top two starting pitchers included Trevor Bauer, Mike Clevinger, Sonny Gray, and Jose Berrios. I have already gone on record that I believe Richards can contend for the Cy Young this year with his stuff and the terrific infield defense that will be behind him in Anaheim this season. I said something similar about Paxton last year, but he went for more than this. I was not going to run away from the prediction two consecutive seasons. McCullers has been amazing to watch pitch this spring, and like Richards, health is the biggest risk play here. I have two starting pitchers holding my staff down, and the most aggressive innings projection for either is 161. Simply put, I need these guys on the bump 30 times in 2018 to be competitive. I had hoped to buttress those two with either Marco Estrada or Mike Minor, but Estrada went for $11 and Minor went for $9 at a time I could afford neither. I did go as high as I could go on Minor, but was disappointed I could not roster either. I did target Lopez based on my bold prediction and the explanation for why I feel he will be better than his 2018 projections say he will be. I was happy to roster McHugh because he should be successful whether he remains in Houston in a Brad Peacock-like role or if he is dealt to another team to become a starter in their rotation. I will get innings and results from him in either role, and that should be a bargain for the price he came. Cobb was a dart throw late because I was hoping he would sign with an American League team and I liked him better than any remaining pitcher that late in the auction after losing out on Estrada and Minor. I was pleased to get Junis at the price after enjoying watching him pitch a few times last season. He could not avoid the homers last year, but limited the damage by avoiding the free passes. He had a 30 percent strikeout rate in Triple-A last season that fell to 19 percent in his first exposure to the big leagues, so I will happily take something in the middle of those two figures. The bullpen plan was simple: grab one closer and speculate on two other guys. This has been the plan each of the past three seasons in AL Tout Wars, and I have finished no worse than second place in the saves category with the plan. I wanted either Ken Giles or Treinen as the primary closer, and then would chase the skills for the other guys. I like Treinen quite a bit in Oakland where the run environments are not always high, so many close games equal many save chances or chances to vulture wins coming during a tie game. Bedrosian is projected as the closer in Anaheim to begin the season, but I am not expecting him to be the sole source of saves in a bullpen after the team had eight different relievers save games during the 2017 season. He has competition from the surprising Blake Parker, but he has a clearer path to 10-15 saves than the speculative plays of Addison Reed and Alex Claudio which went for similar prices. Green was not targeted, but for the strikeouts and ratios out of middle relief, plus his utilization in high leverage situations, he was worth the price for me when he came up in the middle rounds of the auction. I took Mike Wright, Willy Adames, Dan Vogelbach, and James Shields (since replaced with Buck Farmer) in the reserves. I will use Farmer and Wright while Cobb gets ready to join the team, and utilize Vogelbach in that swing spot while I wait for Baltimore or Tampa Bay to recall Hays or Adames. At the end of the day, my numbers had me in second place, just three points behind Larry Schechter. If your numbers do not have you high in the standings, you know you have had a terrible draft which is why I am not too concerned about the other two systems projecting me as a bottom feeder. After all, those same systems loved my teams the past three seasons and only last year's team was ultimately competitive.